Rarely does a day pass that Bob is not inspired, validated , and made whole by the many people he meet. Although appearing as casual meetings, he accepts his reality that all people come into our lives for a reason, some for a season and some for a lifetime. Bob is “that guy” who holds strong convictions of his discovery of self and states: “I find self in others. We all do, but we too often fail to realize that the self we find in others is unavoidable and should not be viewed as good or bad. It is more simple than that", it just "IS". His reasoning is to accept that during those casual meetings there would be "no you without me, and no me without you". We exist as co-joined “selves”, in the same place at the same time. Initially, I was one to find myself among those who would prefer to challenge the truth in the statement. His gift to us is the "Gift of Acceptance". Bob consider Acceptance a valuable gift, as he is sure some have, and many more and I are discovering. Over the years, and beginning very early in his life, he realized that as humans we search for an acceptable understanding of not only who we are, but alsoan acceptable answer to the question, why are we here? We often undervalue our self-worth; guaranteed, most of us have more insurance on our houses and automobiles than we do on ourselves. Many times we "self label" ourselves, such as having low self esteem. We are discouraged from having pride in ourselves but Bob feels an acceptable level of pride is important and necessary. "We need to give ourselves more credit, pat ourselves on the back from time to time, because as someone once said, it's a poor dog that will not wag its own tail". Based upon his observations he began to do something he had considered doing throughout his life. He wanted to write a book. He wanted to write a book because he knew many of us "count on books to know more than we do". He wanted to share his realizations of how progressive growth could be achieved and to effectively communicate a sound and useful transformational vision of how it could be achieved simply, and succinctly to whomever he could. Bob firmly believes "we are not so different after all. We do have our individual and collective purposes that obsess us. We have the capacity to develop a messianic complex, and once developed it will release the energy necessary to bring balance and harmony into our lives, or turn our lives upside down and the lives of those around us". These thoughts are the impetuses for the decision he made to take the actions necessary to arrive atthis point and stand on a very challenging platform, with the confidence and level of preparedness needed to openly present and illustrate some of the revelations he determined worthy of revealing and to ask others to give some thought and consideration. He wanted to write on subject matter that would reveal his layman's but indisputable insights into mankind. Obviously there is a wide gap in our individual and even combined senses of humor, but that gap narrows significantly when we are faced with our interpretation of truth. Therefore, the humorous side of him yielded to a more serious position with the hope of effectively touching the hearts and minds/souls of many through his writing and sharing. In so doing, his goal is to transform, confirm, and dismiss some too long held beliefs and disbelief's that upon closer scrutiny cannot be substantiated. 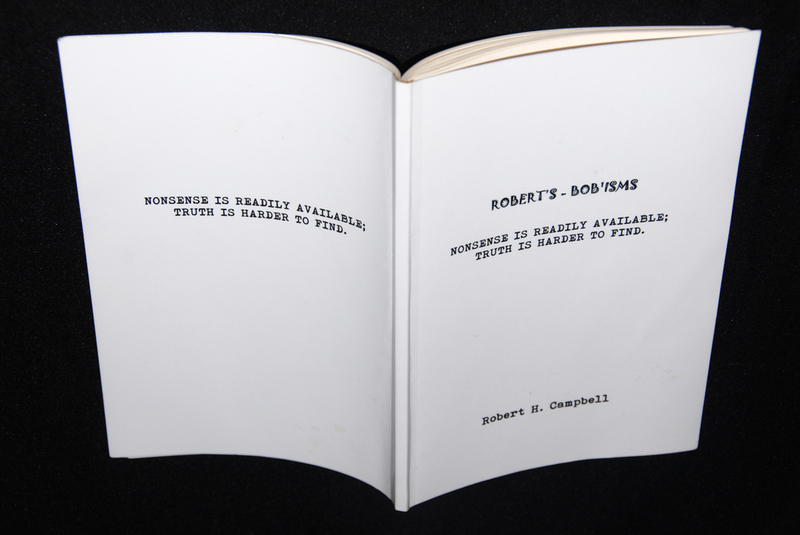 Although he tried, Bob initially found it difficult to conform to a fundamental method of accomplishing his publishing goal. The challenge he faced was one of structure rather than content. Structurally producing his books, using “traditional” publishing methods and formats, was not his intent. He wanted to follow his vision. However, a version utilizing a structural and traditional publishing format was produced as a time saver and is shown below. (To view more thoroughly, including more content, availability, pricing, and ordering instructions Follow the link below). We sometime make molehills in our lives seem like mountains; but for most...and as it should...life goes on. I have observed you from far away distances and at times from very close, reached out to help those in need and provided guidance to those who needed it most. Some found inspiration, converted it as their own, it seemed as though it was their idea but they knew to whom it belonged. As I watched them struggle through their hard times, committed to staying focused and strong, they fell sometimes but I helped them up and through faith we continued on. My heart and mind bewildered them, some could not understand but those who did have no regrets because they accepted me as part of God’s plan. still running toward freedom but enchained by invisible and individual shackles that last. Being a Slave is a mindset being a Master is a mindset too and freedom will be out of the reach of both until they realize, accept, and change their points of view. Although in respond some attack the messenger, it is the easiest thing to do, things will not change and neither will you until you stop doing this to you.